Resolve to Outsource Household Payroll this Year! 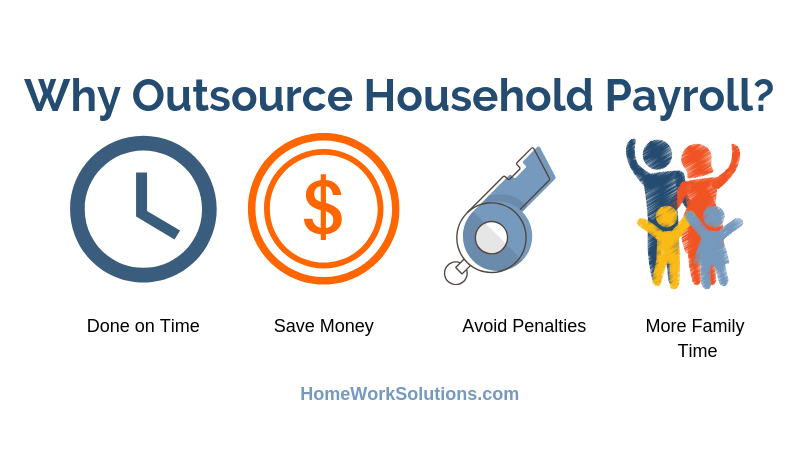 Home / Our Blog / Resolve to Outsource Household Payroll this Year! Is your to-do list getting longer and longer and does it seem like your demands from day to day just never end? We get it. Sometimes there simply isn’t enough time to keep on top of everything. Outsourcing things is a good way to delegate certain parts of your busy life, especially when it comes to things that are not your specialty. This will not only save you time, but it can sometimes save you from making mistakes or missing deadlines. For example, if you have a household employee and you’re required to prepare end of year taxes accurately and on time, it would be easier if you could outsource it. Your accountant is not going to be any cheaper and really doesn’t want to do it, but our team of payroll specialists at HWS can help and want to! There are other amazing benefits of outsourcing payroll – especially when it comes to payroll compliance and tax compliance for your household employee. Benefit #1: Gets done on time. Time is valuable and most days, we need more of it to do what we need to do. Free up time by outsourcing your household employee’s payroll. That way you know your nanny will be paid on time and proper taxes will be withheld. This makes the overall process easy and seamless and you won’t need to worry about spending time sitting down to prepare checks or pay taxes. Benefit #2: Say goodbye to penalties. One simple mistake could cause a penalty or fine from the IRS, no matter how detailed your records are. Many household employers find the payroll and tax compliance process to be very confusing and complicated. By outsourcing this portion of your job as an employer, you’ll minimize your own confusion and you won’t need to be concerned about missing a deadline – it will all be done for you with you needing to lift a finger. Your CPA is not going to charge you any less than a payroll service would, and the CPA is not an expert on household employees. Working with a team of payroll specialists at HWS means you’ll benefit not only from their knowledge, but you’ll have peace of mind knowing that there will be no mistakes that could cost you money later down the road. Benefit #4: Free up time for family! The last thing you want to do at the end of a busy week is come home, pull out your calculator, and start calculating payroll, right? Did you know the weekly cost for a household tax preparation service is generally the same as paying your caregiver for one more hour a week? You hired the caregiver to simplify your life - go all the way and hand the calculations and tax payments to professionals! Don’t try to tackle payroll compliance on your own if you’re unsure about how to do it. If you make a mistake, you could end up facing steep fines or other fees for errors that could have been avoided if you just outsourced the task at the very beginning. Plan ahead and work directly with a household payroll tax specialist so you can save time and problem solve with a professional if you need it. It's not to late to take action this year!